The Hahn's Peak Residence which spans a bridge at the entrance to One Steamboat Place offers a premium view of the ski mountain. 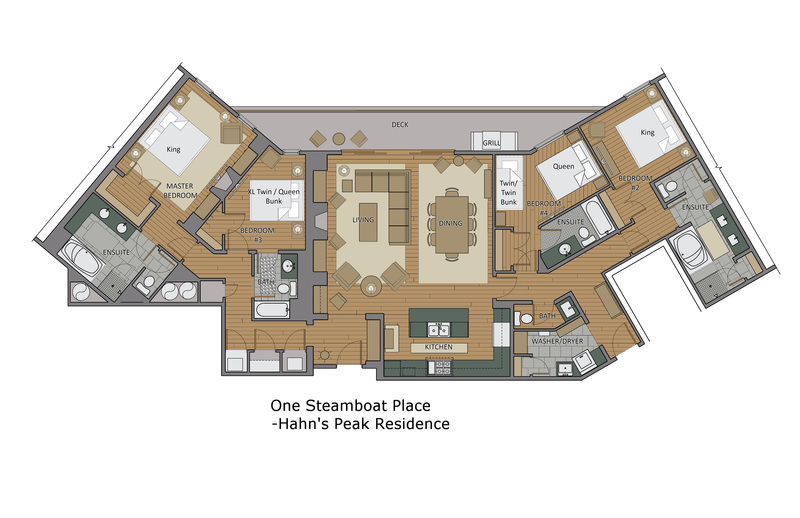 Located in the heart of the Steamboat Ski Mountain base area, right at the Gondola it offers ultimate ski-in/ski-out access. The 2 Bedroom option gives you the choice of bedrooms and you will benefit from the extra space in the common areas since this residence is designed as a 4 bedroom. It can also be rented as a 3 or 4 bedroom option. It offers 4 bedrooms, you choose any 2, each with their own private bathroom, and the flexible bedding options will comfortably accommodate up to 11 guests. The master bedroom with TempurPedic mattress sets the mood with a gas fireplace and the master bath features a steam shower and Jacuzzi tub. The Guest Master also offers a King bed. The third bedroom offers a Queen with a twin bunk over it and the fourth offers two twin bunk beds and a queen bed. There is also a queen sleeper sofa in the great room.